You can use your home, car, savings, and more to secure a loan at a low-interest rate, even if your credit rating is below average. A secured personal loan (or personal collateral loan) is a loan secured by a personal asset, such as your home, vehicle, or savings. The typical advantages of a secured loan are low interest rates and credit requirements, since the guarantee of collateral puts lenders as less of a risk. This can mean an easier time getting approved for your loan, which can make secured loans a good option for if you have bad credit. The consequence of this is that it means you’re at more of a risk, and depending on which of your personal assets you use as collateral, this risk might not be worth better loan terms. Loans secured by personal collateral are best used when you’re sure you’ll be able to make payments on time, and when you’re using the loan as some sort of investment, like for education, or to invest in a business. Some collateral loans are secured automatically by what you buy with them, like a home loan. Others can be used however you want, and are secured by whatever asset you have available to get your loan approved. 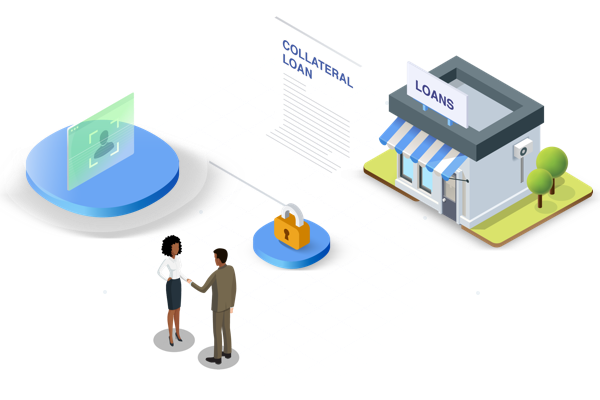 For these kinds where you have the option of collateral, whether or not it’s a good idea is something that will depend on the type of loan you need, as well as your circumstance. Below we’ll check out some of the advantages and disadvantages of secured personal loans to help you decide if they’re right for you. There are lots of different loans that are or can be secured by collateral, all with their own rate averages. For the most part, the larger the loan and the longer the payment term, the lower the rate. Mortgages, for example, usually have rates around 4-5%, while title loans can have rates as high as 300%. These are both examples of loans that are automatically secured. For loans that may or may not be secured, providing collateral will generally allow your lender to set your rate lower than it would be otherwise. Taking out a line of credit, for example, is something you can do with or without collateral, depending on whether you have or are willing to risk the assets. Providing collateral can be a good way to get around credit requirements, since the guarantee of the asset’s value reduces the risk of a loss in the case of foreclosure for your lender. There are many different kinds of secured loans, however, and not all of them have low credit requirements. A home loan, for instance, will usually require a decent credit score (around 680) even though it’s secured. To go again with the extreme comparison of title loans, these are secured by the value of your car, and have high interest and short terms, meaning their purpose is to provide an emergency option for borrowers with low credit scores. For other secured loans, credit requirements fall somewhere in between. Like rates, they’re usually be affected by the specifics of the loan, such as its size or repayment term. One of the bigger advantages of secured loans versus unsecured loans is that they are generally more easily available to those with bad credit. Since you are offering up collateral, the bank sees less risk in lending to you, even with a bad credit score, as they have peace of mind that they can reclaim your assets if you fail to pay off the loan. Ask your local bank or credit union what they can offer you in terms of a secured loan with bad credit. If you’re looking for an online loan OneMain Financial and Finova Financial deal extensively in bad credit secured loans. The main advantages of secured loans are lower rates and easier approvals. But these have their downsides too. Lower rates are usually the result of your lender being at less of a risk, but this is only because the risk is greater for you. When it comes to something like your home or car, a lower interest rate isn’t always worth the risk of losing your asset. Similarly, approving your loan without a credit check, or in spite of bad credit, puts your lender at more of a risk, meaning they’ll probably compensate themselves by raising your interest. Judging which benefits are more valuable for you is key to choosing the right loan. In some cases a high-interest loan can be a better deal. For example, if the payment term on your loan is short and you don’t want to risk losing your collateral. On the other hand, if you can’t afford the interest rate of an easy-approval loan, you might be better off giving yourself time to improve your credit and aim for an unsecured loan. A common personal asset used to secure a loan is your home, either as a traditional mortgage, a home equity loan, or any kind of loan where the lender has accepted the use of your home as collateral. For a traditional mortgage, the property itself acts as collateral until you fully own your house. For a home equity loan, it’s the amount of the mortgage you’ve paid off that you can bargain with. Vehicles are another common asset used to secure a loan. Like with a home, this can be done to purchase a new car with an auto loan, or you can use a car you own to secured a title loan. And in general, anything you own of considerable value can be used to secure a loan, like jewelry, a computer, etc., or even money you’ve got put aside, like a savings account or your 401(k) funds. Depending on what kind of asset you plan to use as collateral, there are some things you’ll want to make sure of. For emergency loans, like title loans, all you’ll need is a lien-free car, while for a home equity loan, you’ll need to make sure you own a big enough percentage of your home before you can borrow against it. When applying for a loan, it’s always smart to compare as many lenders as you can, and be careful what you agree to. A lot of lenders will make promises that seem better than they are, and If you’re not careful, this could get you into trouble. As long as you plan ahead, however, a secured loan can be a useful way to get better loan terms or help yourself out of a jam.